I love CVS. I don't go as often as I used to, but when I do I'm always welcomed with some great coupons from the ExtraCare coupon machine. If you don't have a CVS ExtraCare card you have to go one. I deem it mandatory, and I will be checking in with you all later. Just playing, but really there is no reason not to get one. I get great coupons from them, plus I get Extrabucks to spend. One of the recent coupons I got was $3 off an Sally Hansen nail product. I wasn't going to pass that one up! This is what I brought home. Cinna-snap is a deep red jelly. 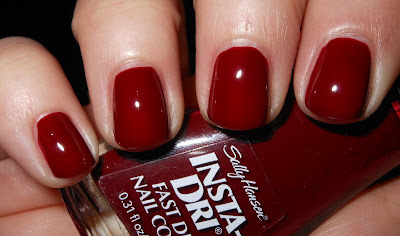 I was craving a deeper shade, especially one that was quickly and easy to apply. Sally Hansen Insta-Dris are perfect for this. I'm not a huge fan of the brush, but it applies more evenly and easier than other deep red jellies I have. This clearly isn't a unique color, but I think it's a classic shade that no matter the brand every nail gal should have! Beautiful! And I love CVS rewards! ohhh wow!! This is amazing! I need to get this for winter and holiday looks! Oh wow. That colour is HOTT! Hey, what a beautiful nail polish!!! I loved the color! I am already joing your site, is very nice.